In the past Dudjom Rinpoche was Rigdzin Nuden Dorje; in the future, it is said, he will be born as the Sugata Möpa Thaye; while in the present he manifests as the representative of Padmasambhava, Drogben in person. His Holiness’s previous incarnations have included some of the greatest gurus, yogis and scholars, among them Shariputra, Saraha, and Khyeu Chung Lotsawa. And, indeed, Dudjom Rinpoche was of royal lineage, descended fron Nyatri Zangpo and from Puwoo Kanam Dhepa, the king of Powo. His father, Kathok Tulku Norbu Tenzing, was a famous tulku of the Pema Köd region, from Kathok monastery; his mother descended from Ratna Lingpa and was called Namgyal Drolma. His Holiness was born in the Water Dragon year (1904), early in the morning of the tenth day of the sixth month, with many amazing signs. His previous incarnation, Dudjom Lingpa, had told his disciples: „Now in this degenerate age, go to the secret land of Pema Köd. Whoever relies on me, go in that direction! Before you young ones get there, I the old one will already be there.“ This came to pass exactly as predicted. He was already three years old when they recognized his reincarnation. Since His Holiness was a direct emanation of Dudjom Lingpa, he could remember his past lives clearly. Phuktrul Gyurme NgedonWangpo and Lama Thubten Chönjor of Ling came to Pema Köd and enthroned him. Gradually the disciples of the previous Dudjom arrived. His Holiness was taught reading, writing and the five common sciences. As he was taught, the power of his awareness blazed like fire. Whatever he learned he could comprehend through a mere indication. He studied many texts and commentaries, such as the Dom Sum, Chod Juk, etc. It is said by Lama Konrab that at the age of five, he started discovering Ter. He studied for sixteen years with Phuktrul Gyurme Ngedon Wangpo, who was a holder of the teachings of the previous Dudjom. From Khyentse Rinpoche he received the tantric teachings (Gyud, Lung, and Men-Ngag) of the Sangwa Nyingthik as if he were a vessel being filled. He also received the „rediscovered teachings from Gedrung Thinley Jampa Jungne of Riwoche and Gyurme Ngedon Wangpo that he could really understand. His Holiness obtained realization through this. He himself said that while very young he always had various visions, and his karma to discover the deep ‚treasures‘ awoke. At thirteen he met Guru Rinpoche (Yab-Yum) in person, and after having received the legacy of the self-appearing non-human teacher, the wisdom Dakinis gave him the yellow papers and he wrote down Ters. From Togden Tenpa he received both the wang and lung of the Dzogchen Nyingthig Yabshi, which was the lineage of Nyoshul Lungtok Tenpai Nyima. Then he went to the center of the country and from Jedrung Rinpoche of Riwoche, Dudjom Namkhai Dorje, he received the Kangyur lung, Dam Ngag Dzöd, the seventeen Sangchen Ngepai tantras, Nyingthig Yabshi, etc., and all the teachings of the Dzogpachenpo. He received them completely and was considered his teacher’s heart son. From Tulku Kunzang Thekchog Tenpai Gyaltsen he also received many deep teachings. From Ngagtsun Gendun Gyatso he received all the teachings of Pema Lingpa, the Dzöd Dun, and others. From Mindroling Vajracharya, Namdrol Gyatso, he learned the rituals, mandalas, songs, dance and music of Tertag Lingpa, along with many other teachings. From the great Khenpo Jamde, also called Pande Odzer (a disciple of Mipham Rinpoche), he received the Nyingma Kama, Khagyed empowerments, Sangye Lingpa’s Lama Gongdu and Sangwa Nyingpo according to the Zur tradition; as well as the cycle of the Odsel Sangwa Nyingthig. He also received many tantra commentaries like the great commentaries of Mipham himself, the Nyingthig Yabshi, etc. – thus receiving an ocean of deep and detailed teachings. His Holiness considered Khenpo Jamde as his second kindest Lama and took many vows of Pratimoksha, Bodhisattva, and the Vajrayana from him. He also received teachings from the great beings who were disciples of the great Khenpo Nyoshul: Ngawang Palzang, Chatral Sangye Dorje, Lama Orgyan Rigdzin, Kathok Chagtsa Tulku, Pulung Sangye Tulku, and others. He received teachings from them and he gave teachings to them. Taking his practice very seriously, he sent to a secret place called Kenpa Jong or Punsuk Gatsel, and accomplished Dorje Phurba. He practiced throughly the gradual path of Dudjom Namchag Putri. At Buddha Tse Phuk he did Tse-Drub and his Tse-chang boiled. He received the auspicious signs when he was practicing the gong-ter of Duddul Drollo (the Dudjom Dorje Drollo gong-ter). When in Paro Taksang, he rediscovered the Putri Repung, the Tsokye Thugthig and the Khadro Thugthig, for which he wrote down the main parts. As he was trying to preserve the old Ter, he did not make much effort to rediscover new ones. (At Samye and at Taksang, even though they were there he did not take them.) In short, in all these important holy places where he practiced he always experienced the signs of accomplishment. Then he started benefitting beings. As his teachers prophesied. he gave the Rinchen Terdzöd (Empowerments and Transmissions) ten times, Pema Lingpa’s Palden Chö Kor three times, the previous Dudjom Lingpa’s work many times; the Jatsun Po Truk, the complete empowerment and transmission of Nyingma Kama and innumerable other teachings. His Holiness wrote about twenty-three volumes of various gong-ter and treatises, all of which have been printed. 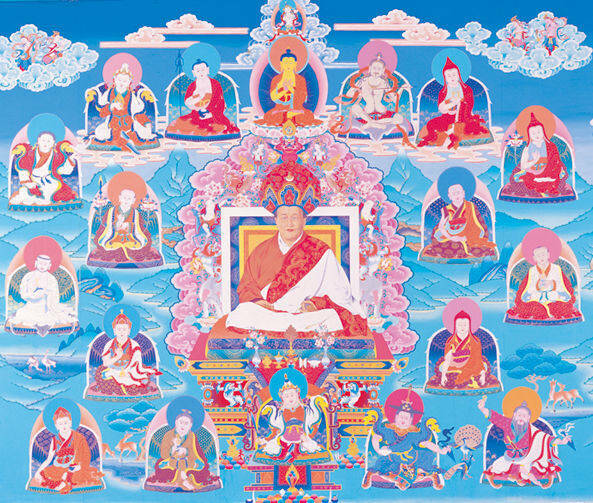 He also collected all the Kama teachings of the Nyingma lineage, as Jamgon Kongtrul had collected the Terma teachings. In Pema Köd, he established many new monasteries for both Gelong (ordained monks) and Ngagpa (Yogis). He regrouped many texts. Nowadays, in this tradition both the books and the stream of empowerment exist and survive solely due to his kindness, which is impossible to measure. In Kompo region he reconstructed the Thadul Buchu Lhakhang and close to it he built anew the monastery of Zangdokpalri. He erected anew the tantric center of Lama Ling; at Tso Pema (Rewalsar) he established a retreat center; at Darjeeling, Tsechü Gompa; in Orissa, Dudul Rabten Ling; and in Kalimpong he founded the Zangdok-Palri Monastery. In North America he established many Dharma centers, named Yeshe Nyingpo, as well as many retreat centers; in Europe he established Dorje Nyingpo in Paris and Urgyen Samye Chöling Meditation and Study Center in Dordogne, France. Many other Dharma centers around the world were under his guidance. Whenever he gave teachings in Tibet and India, great teachers – like the two Mindrolings, Trulshik Rinpoche, Chatral Sangye Dorje, and others – came to receive them. Among all the high lamas there are none who didn’t receive teachings from him. They all had great confidence in his realization. So numerous were his disciples that they can’t possibly be counted. Nyingmapas from Tibet, Bhutan, India, Ladakh and all around the globe were his students. Lodrö Thaye, who led a life encompassing the activities of one hundred tertons (treasure revealers) has said that Möpa Thaye (Dudjom Rinpoche’s future incarnation) will have the activity of one thousand Buddhas. That this great being will perform the activity of all his previous lives and have many disciples is all due to his own power of Bodhicitta and prayers. As Shakyamuni, even though enlightened, performed the illusory activity of dying for the benefit of worldly beings, likewise H.H. Dudjom Rinpoche, with many miraculous signs, entered Mahaparinirvana on Janurary 17, 1987. This brief biography has been adapted from the History of the Dzogchen Secret Qunitessence, Life Stories of the Vidyadharas of the Lineage composed by Nyoshul Khenpo Jamyang Dorje. It is available together with other essential texts in The Lamp of Liberation, A Collection of Prayers, Advice and Aspirations, published by Yeshe Melong.